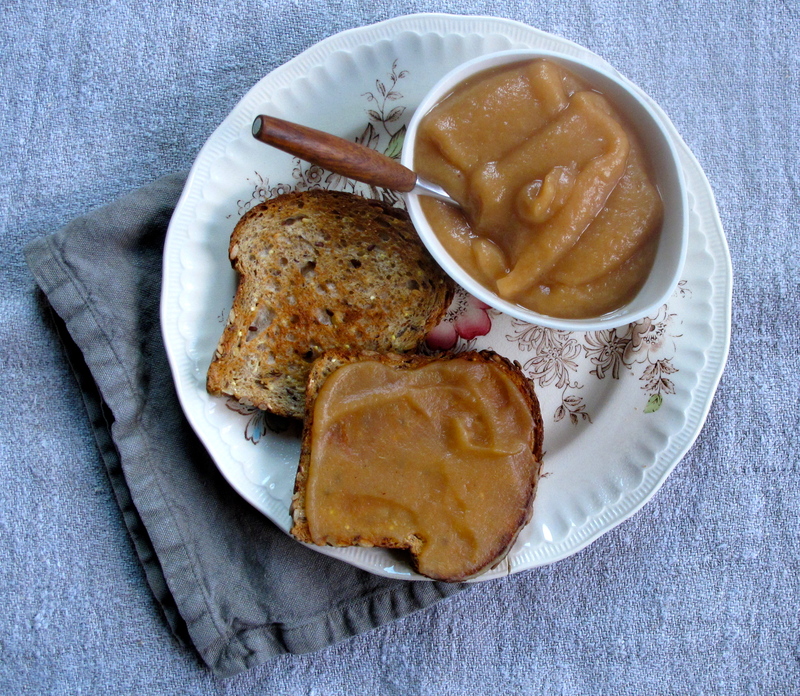 This apple butter might be more aptly named sweet spiced apple butter but of course that depends on the kind of apples you use. Macintosh will give you much sweeter butter than granny smith for instance, but use what you like and don’t worry about it too much. It’s perfect on a whole-grain toast in the morning. And it would be a lovely accompaniment to breakfast quinoa or oats just to mix things up a bit. It’s so tasty in fact that I’m now not sure why people put “normal” butter on their toast. But then again, I’ve come to wonder about a lot of things people eat. Just sayin’. Place apples, spices, and water or cider in a heavy bottomed pot and bring to a boil on high heat. After about 5 minutes or so, turn heat down to medium, add the sugar and lemon juice and let bubble away until the apples are very tender, about 25 minutes. If you need to add a bit more water or cider, do so a little bit at a time but you want your butter thick so don’t add too much. Once cooked through and the apples are mushy, turn the heat off and let cool. Remove the star anise and cloves. Purée the mixture in a blender or food processor. Or if you like it chunky, simply mash it with a potato masher until you’re happy with the consistency. Keep it in the fridge or freeze it for later use.